It’s been forever and a day since I’ve made a blog entry here on my website. I just looked when I last published a blog entry and it was almost exactly two years ago. Maybe there’s something about these cold, cloudy days of November as we transition from autumn into winter that makes me pensive. 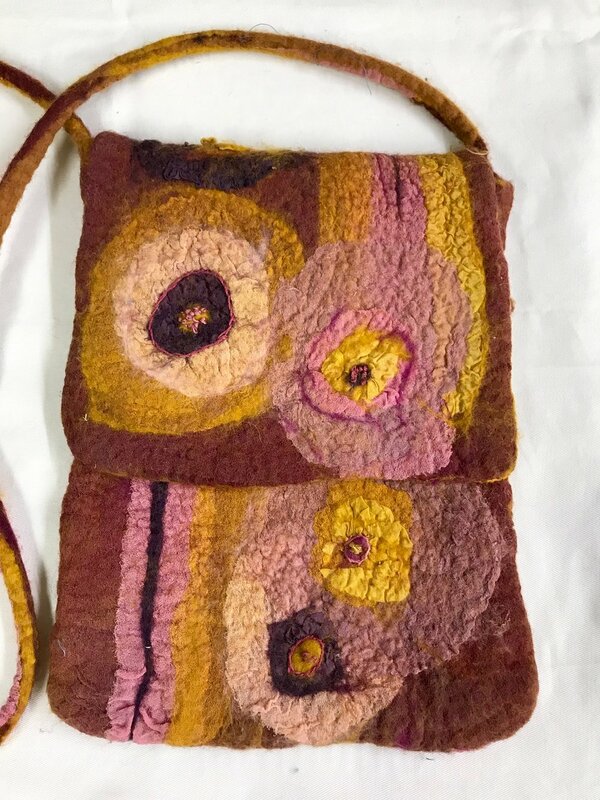 Or perhaps it’s the transition that change brings to my studio from eco printing and working fabric into eco printed garments into wet felting and stitching that reminds me that I haven’t been very diligent at keeping up with my website blog. And this evening, after a Sunday I’d planned to spend relaxing, but due to a new idea popping into my head, ended up working in my studio, I sat down, grabbed my computer and began to write. It hadn’t entered my mind until just now to do this today, although it’s been on my “to do” list for a long, long time. This seems to also be how I work in my studio. On weekdays, first thing in the morning, I enjoy a coffee with friends at a local coffee shop. On my way home, caffeine in my system, what I’ll do in the studio that day often pops into my head. Sometimes I know this ahead of time because deadlines and obligations dictate my day. But often my ideas of what to create on any given day arise on my drive home from coffee. And there are always a number of things to chose from, depending on the season. 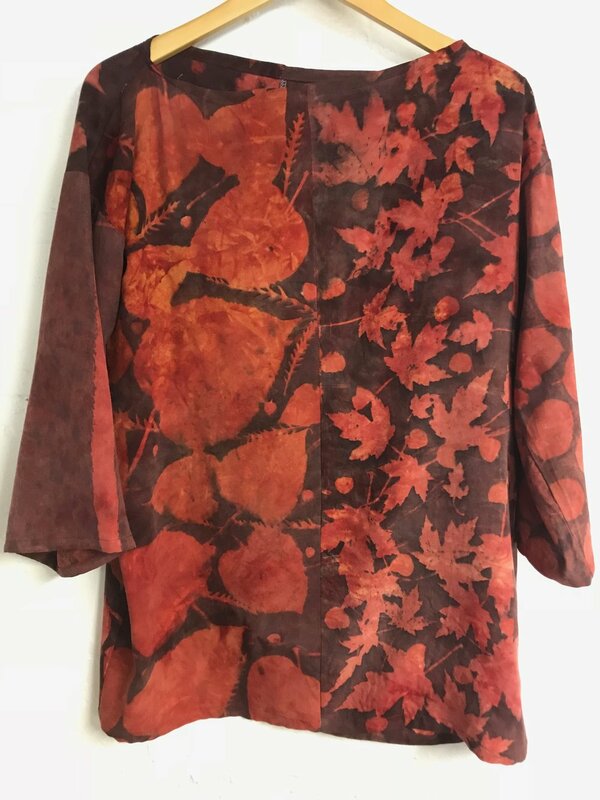 If leaves are available to me, I can choose to prepare fabric for natural dyes, do the dyeing, eco print, design a garment, or sew the garment. I could decide to eco print on paper. Or make paper and eco print on that. Or I could tend to my organic indigo vat and if it’s cooperating, do some indigo dipping or prepare fabric with shibori resists and indigo dip it. 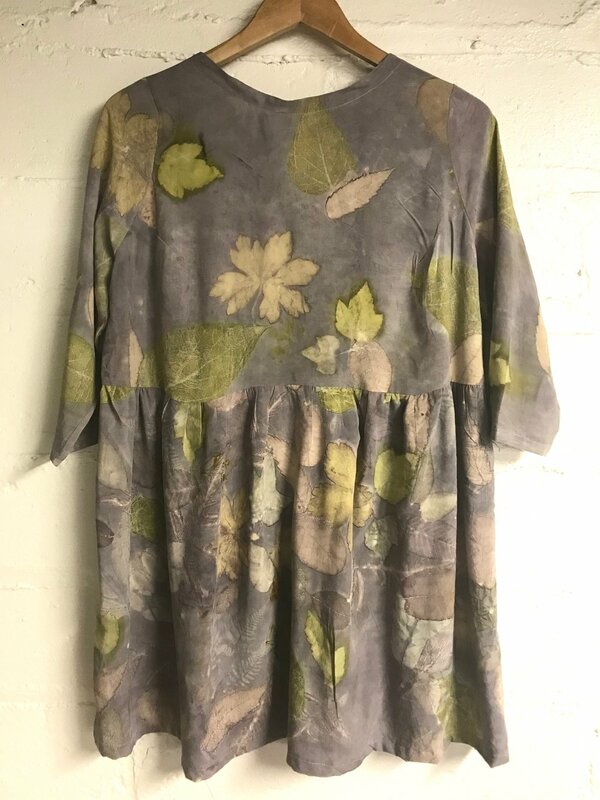 Or perhaps something brand new will have caught my interest and I’ll be eager to try that out – a new mordant, a particular combination of dyes to create a new shade of color, experimenting with new leaves or new fabrics or a new garment design. When there are no more leaves, my possibilities for studio work narrow a bit. 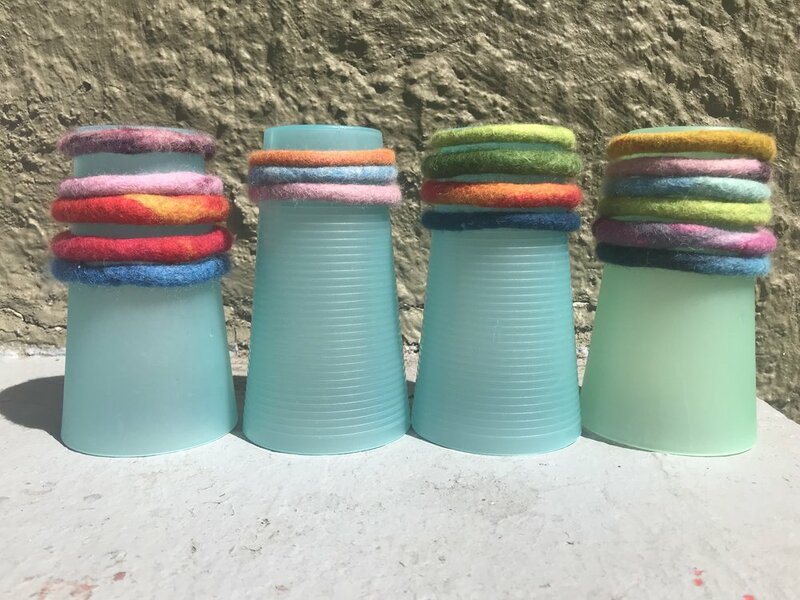 After sewing there are always scraps and often these scraps are hand dyed and or eco printed or indigo dipped. As the scraps pile up I begin wondering how to use them in an artful way. So I’ve been piecing them together on a cloth background to make abstract designs or landscapes. After putting the scraps in order on the background, the hand stitching begins. I use traditional western embroidery techniques as well as Japanese shashiko style stitching, which employs running stitches and repeating designs. 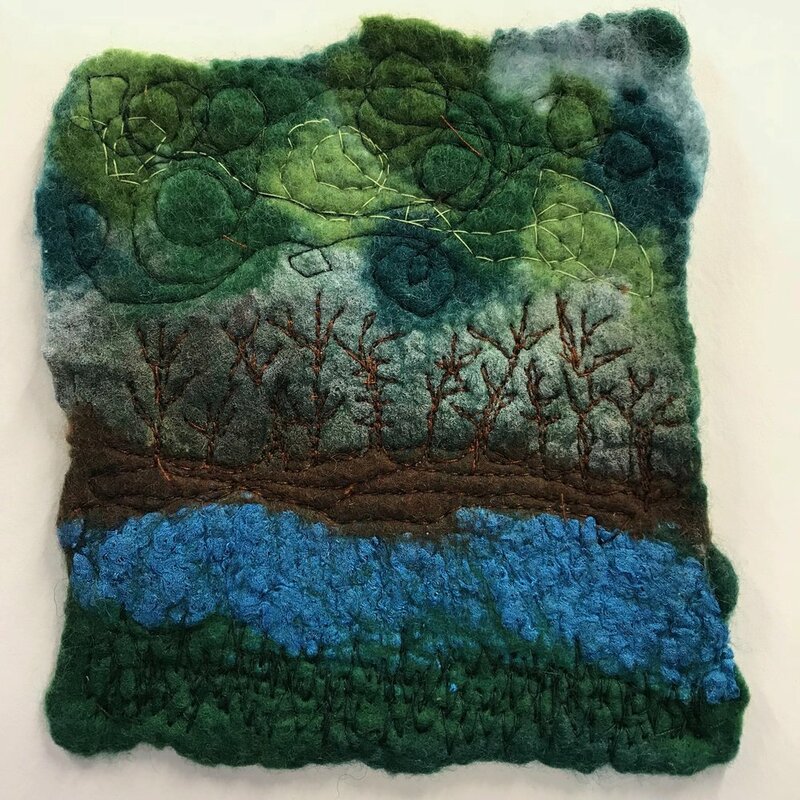 And if I decide to work on wet felting, there are so many directions I can take. The versatility of the medium is one of the things that intrigues me. 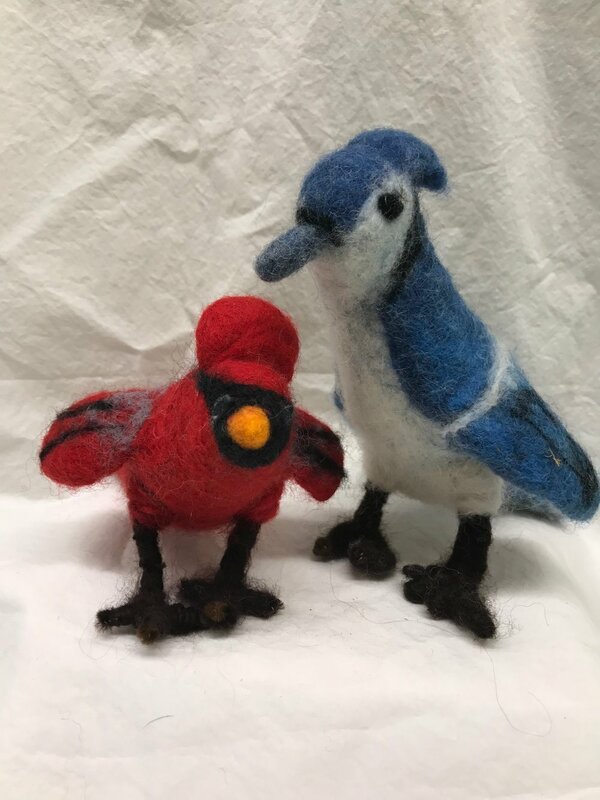 Often I have special requests from individuals or shops to fulfill but when the choice is up to me, I could work on a felted landscape, make some little solid wool animals, make a vessel, a hat, wrist warmers, nuno felted scarves, coin purses, human figurines, handbags, felted balls for your cat or dog or toddler, or try something new. And of course, there’s always paperwork, catching up with my website or Etsy shop or posting on Facebook, customers or potential venues to contact, classes to plan, and so on. Although at times I feel overwhelmed and wish I found it easier to take some time off, I love what I do! I’m never bored, that’s for sure. And I love that others enjoy what I create. I feel fortunate that I can bring beauty, whimsy and color and something unique to the lives of others. And I love the processes that brings that about. So although my list of things to do is never empty and at times I have a clear path in front of me for how to spend my day and other times the choice is up to me, I know that when my day ends and I come up from my basement studio, I will feel that I have accomplished something creative and I will feel my day has been well spent. And although all of these creative activities call to me, I am also working on living a balanced life and make time for input as well as output – time to read, watercolor, rest, walk, spend time with friends. And I am truly grateful for having found so many passions in my later years of life!